The UK Winter is predominantly a cold, wet and damp season. However, it can also be very dry, especially with snowfall when the air is crisp and dry. Its been pretty easy this year so far with bulbs already appearing. In Winter, both Vata and Kapha can get aggravated leading to coughs & colds and Spring hayfever. For tips on a healthy Winter, please see here…. If you do succumb to cold like symptoms help clear mucous by eating light, warm, simple foods as you rest. Soup is ideal. Avoid dairy products, sweets, fried foods and yeasted bread which increase congestion. Fresh ginger tea is excellent, especially with raw honey added once the tea has cooled down. Raw honey clears mucous and Kapha due to its heating, drying and channel clearing effect. It is the best sweetener for Kapha types and is good for all in spring. If you have a fever, a short fast is recommended by Ayurveda, agreeing with the saying ‘feed a cold, starve a fever’. 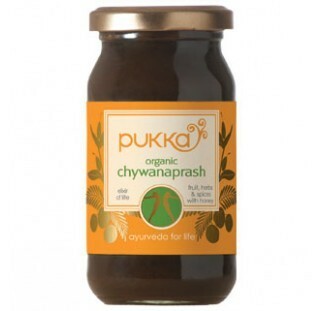 Chyvanaprash – take daily to strengthen lungs, boost immunity and rejuvenate all the body tissues, increasing strength and virility, as well as alleviating respiratory conditions. It is named after the sage, Chywana, who had become old but used this formula to become young and satisfy his young wife! Trikatu made of ginger, black pepper and long pepper which act to dry up mucous and clear channels; especially long pepper (pippali) which rejuvenates the lungs and clears Kapha. It is traditionally taken with raw honey which aids in clearing mucous. It should not be taken if you are pregnant or suffering from the effects of aggravated Pitta dosha (heartburn, hyperacidity, ulcers). Sitopaladi is a delicious combination of candy sugar, cinnamon, cardamom and other ingredients. It is very good at digesting mucous, acting as an expectorant, rejuvenating the respiratory system. It is taken with honey and ghee. Turmeric is a potent natural antibiotic and can be used all respiratory tract infections. Boil half a cup of water with 1/2 teaspoon of turmeric, add a little milk then use as a gargle. Its also great for helping to prevent hay fever and other Spring allergies by reducing the body’s inflammatory response. Mix ½ tbsp ginger, black pepper, cardamom, clove, cinnamon and turmeric. Ad 3tsps of raw sugar. Mix ½ or 1 tsp of this mixture with honey or warm water and take twice a day (again a home made version of the classic formulation, Sitopaladi). Mix ½ tsp fresh ginger juice with ½ tsp honey and take three times a day. Soak 2 parts fresh ginger root, 3 parts cinnamon and a pinch of cardamom in a cup of hot water for 10 minutes. Add ½ tsp of honey once it has cooled down to warm and drink a glass of this tea several times a day. Crush ¼ tsp fresh ginger root with 8 fresh basil leaves, 2 peppercorns, 2 cardamom seeds, and 1 cup of water, ½ tsp turmeric powder, 2 cloves, and 5 fresh mint leaves. Boil, filter and add 1 tsp honey. Drink 2 or 3 times a day.